Having cared for someone you love for so long it’s not only the grieving you have to contend with but it is really difficult getting used to not having things to do. Oh don’t get me wrong I have plenty to do but not what I have been used to. As I have done for the past two plus years I wake in the morning and just run through the things that I have to do during the day. But these mornings I wake and realize there is very little I really have to do. So that’s where my self preservation kicks in and I make my mental list with the things I will do for the day, some are now actually out of the house and most are for me. I guess that’s the way we all get thru our daily lives, with a bit of planning and don’t forget out little piece of me time each and every day. “Davine Time” update: Last night I started back at my Meditation – Inner Mind - Inner Peace classes, not surprisingly my state of mind at the moment had me in tears at one stage. But by the end of the class I felt I had transported my mind to some nice peaceful places. 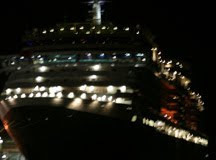 Around 9.30pm when the class had finished I thought it might be fun to head down to Station Pier and have a look at the ship “Queen Victoria” that was visiting Melbourne and due to depart around midnight. Shane thought it a bit crazy to head of at that time of night but hey that’s our FUN. It is a very huge ship being 294 metres (964.5ft) in length and 32.3 metres (106ft) in width. It can carry up to 2,000 guests in 990 staterooms. It was moored next to the "Spirit of Tasmanai" which looked tiny next to it. When we got down there it was so cold and extremely windy I couldn’t really get a clear photo. But I still thought I would share my blurry one. I love the blurry anyway. What a whopper of a ship. Good for you getting to see it. So many times, I have said, oh well next time....now I realize that we are never assured of the "next" time opportunity. That's one of my reasons for choosing opportunity for my 2010 word. Awesome to hear that you made it to your meditation class Davine, good for you. You deserve to have total "me" time. Quite the "boat." I bet it was wonderful to view such a sight especially at night time! I'd love to be a vacationer on one of these boats one day! Quixotic ... that's what we can be with our "self-time". Go with the flow. Do it! What a good think to decide to do, whether our kids agree or not. We use to go to my dads every Friday night for a very long time, plus sometimes we would see him on Saturday and or Sundays at his house or ours. After he died we didn't know what to do. I am glad you are doing good things for you! !